Yahoo movies has a nice summary up of the recent LA Times article in which Nolan talks about his plans for the Superman franchise, as well as the fact that he’s going to be making only one final Batman film. Of note in the article…not only will ‘Batman 3′ be his last Bat-film, but it will be an ending to Batman! He will be wrapping up the characters in the Nolan-verse and giving his tale an actual ending, rather than an open-ended conclusion. He will officially be making this a self-contained bat-trilogy, so expect a full re-launch of the Bat once Nolan is through. 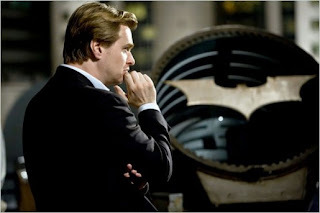 Nolan goes on to note that the villain for the third bat-film will definately not be Mr. Freeze. Nolan admits in the interview that the idea for his take on Superman came about when he was stuck while working on the story for the next Batman movie. In a fit of writer’s block, David Goyer, who crafted the stories of the previous two films with Nolan, made an off-hand proposal of what they could do with a Superman movie. Thanks to Grayson for the tip.